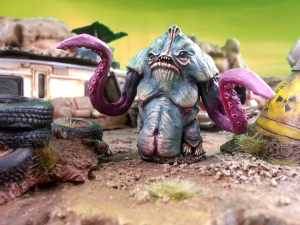 ThunderChild Miniatures has added their new Gribley Wiblin monster to their webshop. Emerging from the fetid sludge of the rad-swamps, the Gribley Wiblin is a beast both feared and loathed. These fiends like nothing more than to gnaw on the junk of the old world. Due to their fondness for generators many towns have dedicated teams on constant Wiblin watch. Though, with Wiblin stench being similar to month old milk, volunteers are hard to come by. This set contains the parts to make a single Gribley Wiblin, cast in high quality resin and standing a rotund 47mm tall. Supplied unpainted and unassembled.